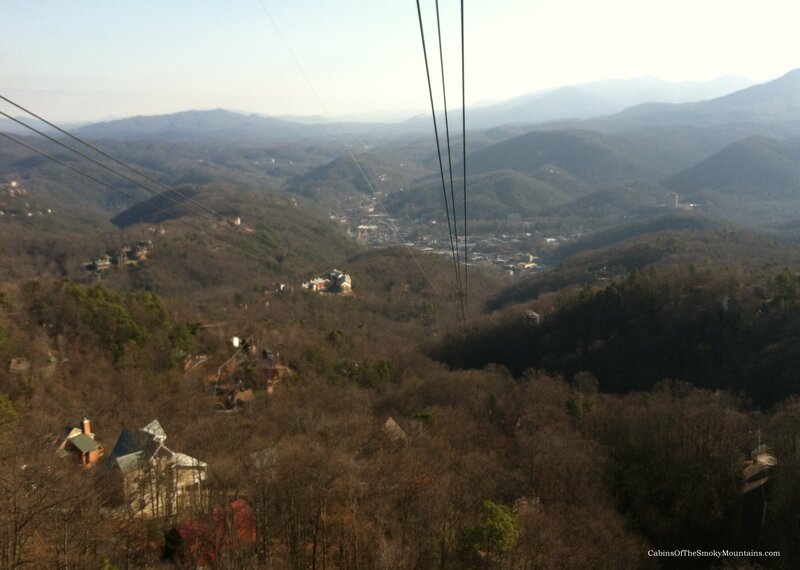 Ober Gatlinburg is Gatlinburg’s own ski resort, and one of Tennessee’s top attractions. A year-round playground of mountain fun and amazing scenic views, Ober Gatlinburg offers an adventure even getting there, on one of America’s largest Aerial Tramways. Take a free round trip on the Tramway with our compliments when you book a cabin with us!. A Free Ticket round-trip is all part of our Trip Cash book of free coupons worth over $400. 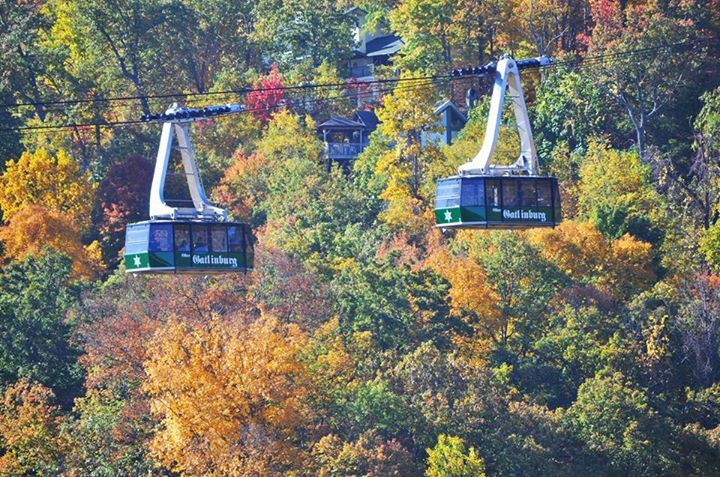 The cable car departs regularly every 20 minutes from downtown Gatlinburg going directly to the ski resort.The tram station is located at Parkway & LeConte Street. The 2.1 mile journey provides an exciting alternative to the mountain drive up to the ski area – which in winter can be a task. 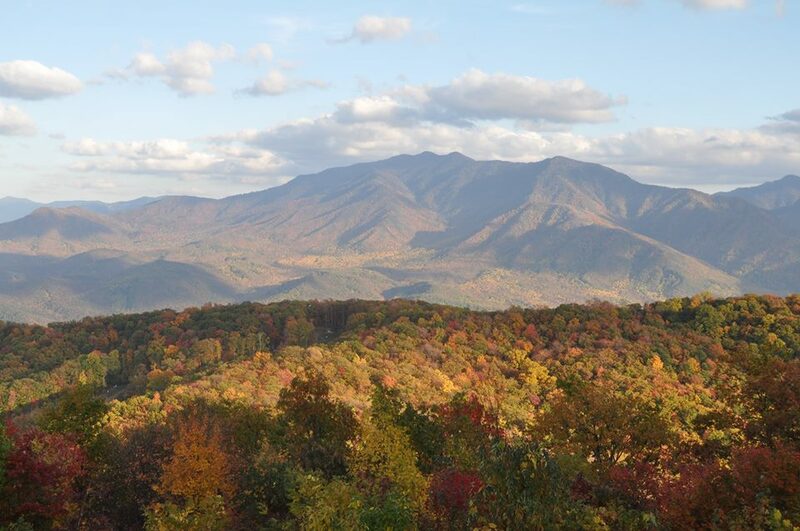 And did we mention some of the best views of Gatlinburg below and the surrounding Smoky Mountains? The tramway has been in operation since 1973, with 2 large-capacity, counter-balanced trams. The cars were replaced in 2007 with brand new trams designed and built from advanced alloys in Switzerland. Even at the top of the Smokies, Ober Gatlinburg can take you higher. From the resort, take the year-round scenic chair lift for a further trip up the mountain to the top of the ski slope. In fall, you’re liable to see a view like this one. You can’t ski back down the slope in summer, but there’s another fun way down, included in the ticket. Take the Alpine Slide through the trees and ski trails, a fun and easy ride with dips and curves on your dry-land, roller-driven sled down the track. If that whets your appetite for more motion, try Ober Gatlinburg’s newest adventure, the Ski Mountain Coaster. With speeds you adjust yourself, it’s another great run through the mountain terrain, for thrills and great views in the mountain air. While you’re at Ober Gatlinburg, check out the numerous activities that make this an amusement park in the mountains, perfect for the whole family. From games and rides to animals and mini-golf, there’s also a large indoor ice rink in the climate-controlled Mall, open all year. Try a ride up to Ober Gatlinburg on a hot summer day and put on your sweater for some ice skating! Shoppers are catered to as well at Ober Gatlinburg, from the Shops at Ober at the base of the tramway in downtown Gatlinburg, to the Mall shops on the mountain. You’ll be hungry with all this activity, and there’s a food court in the Mall, as well as Gatlinburg’s highest restaurant and lounge for a serious lunch or dinner – also the site of the resort’s Oktoberfest, celebrated every year. Snow is what a ski resort lives for of course, and Ober Gatlinburg has it. The ski area has 10 trails and 4 lifts, as well as a fun snow-tubing run at the base that is usually open from Thanksgiving until Easter! Ober Gatlinburg uses some of the highest tech snow making equipment in existence to amplify the natural snowfall of the Smoky Mountains. See our many articles about Ober Gatlinburg, and for more information call the resort at (865) 436-5423 or check the Ober Gatlinburg website.